Can this lake get any better than it is right now??? If so, I want to be there when it happens because this lake is simply on fire! Of course the action and sheer numbers are great and that’s nothing new. However, as I’ve been saying in recent updates, the bass are growing up! We’ve seen the overall average size make another major leap in the past two months (Jan/Feb) and not just because it’s spawn time. 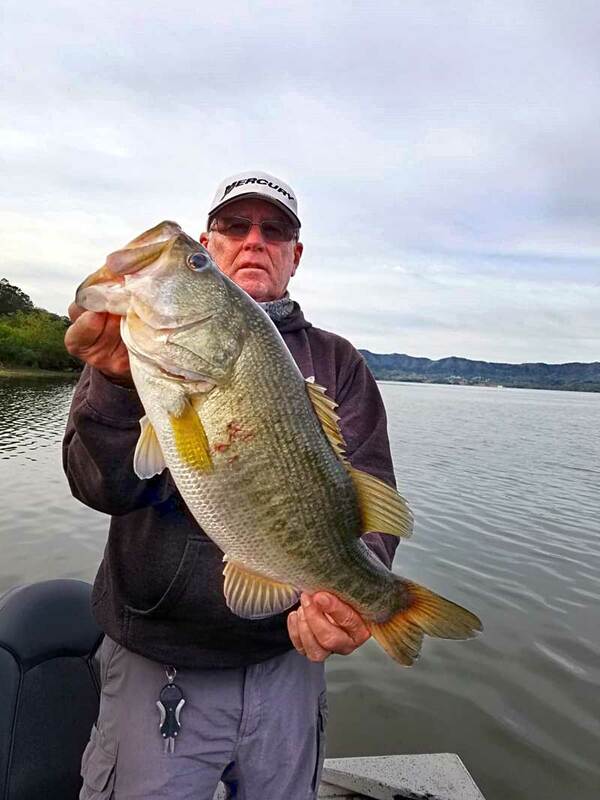 No, there are a lot more bass being caught in the 5-7 lbs class since that first season and particularly that early April 2014 trip when Terry Oldham, Steve “Big O” Parks and I caught tons of 7 lbs bass that were feeding on the giant gizzard shad (shad were spawning). Right now and for the past 2-3 months, the daily average catch per boat has been around 130-150… with at least one or two boats per week exceeding 200 bass in a day! However, it’s the average size that’s really impressive. It’s one thing to catch that many bass in a day and they average 1-2 lbs; it’s another to catch that many in a day and they average 3-4 lbs. Also, there are many days when the big bass of the day will be topping 7 or 8 lbs and every boat landing at least one bass (or more) of 6 lbs. When you combine that much action and numbers with that kind of size, well, the only way it could be any better is if they were ALL BIGGUNS combined with that many numbers…and we all know that just doesn’t happen. At least not on public lakes, it doesn’t. You want more evidence there are big trophy bass in Picachos RIGHT NOW??? 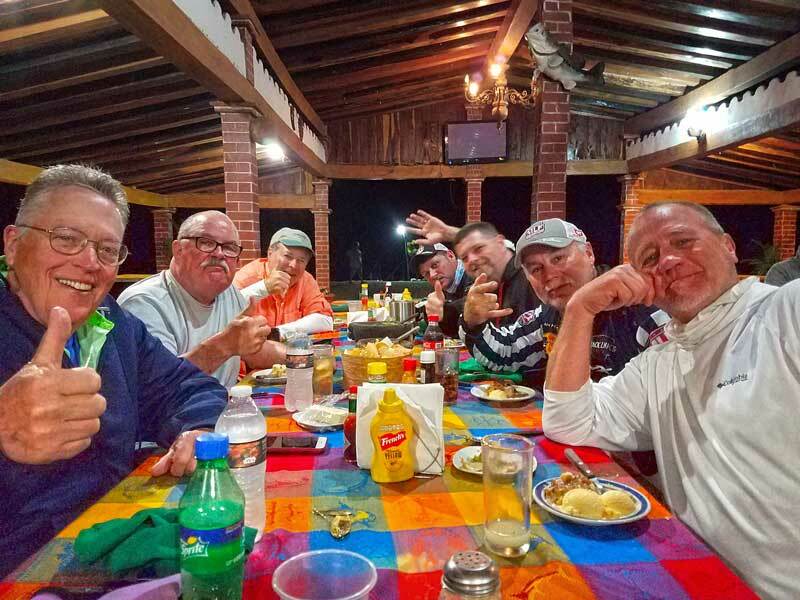 Two weeks ago I asked Terry Oldham (Oldham Lure Company) to visit our camps at Picachos, El Salto, and Comedero. His primary purpose was to tune up the outboard motors, trolling motors and repair any sonars that weren’t working good. I also sent him to check the “big bass” fishing at Picachos because you will not find a better fishermen on the planet and especially for finding big bass in deep water! After he finished working on motors, trollers and sonars, he had two days to fish Picachos before moving on to El Salto and Comedero. 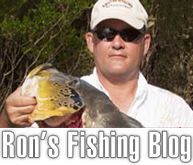 It didn’t take Terry long to find some big ol’ toads! The first day he caught around 75 bass fishing alone. His biggest? A long old bass that weighed 10 lbs, 8 oz! He hooked that bass in a 25′ ditch! He also landed several other bass in the 6 and 7 lbs range, but a lot of bass of 4 and 5 lbs, all in depths from 22′-27′ using his 1 oz Oldham Jig with a Rage Tail Rage Craw as the trailer. The next day was even better as he had spent most of the first day establishing a big bass pattern. So on Day 2, he just went looking for more areas holding big bass in the same depths. Terry fished all day and with about an hour of daylight left, he had right at 100 bass (again, fishing alone) with the largest so far being 7.8 lbs, but a lot of 4’s and 5’s again. Then with one hour left to fish, he moved to a different part of the lake and an area he had caught a lot of big bass in the past. Boy did he make the right call for that last hour of fishing! In that final hour he landed around 50 bass with the largest weighing exactly 10 lbs! However, he also landed 7 more bass over 7 lbs (two over 8 lbs), all of this in the final hour from ONE spot!!!! This time the depth was 28′ which is a depth that very few (if any?) anglers fish on Picachos. You may ask “Why? 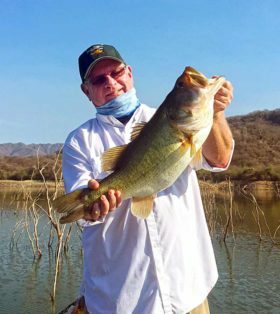 Nobody fishes that deep on Picachos!” Very simple: most who visit Picachos for fishing are not thinking so much about trophy bass but rather just wanting a lot of action, wanting “the pole to bend” as many times as possible each day! 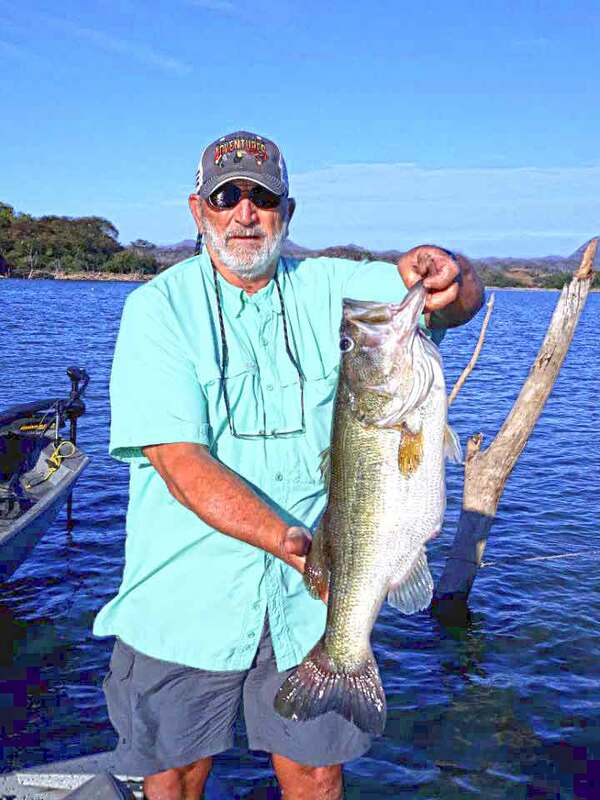 Up until NOW, if one of our customers is going to Picachos to primarily catch big bass, then we didn’t do a good job of steering him to the right lake because we have two other lakes that are great for catching trophy bass, those lakes being El Salto and Comedero! This is just more evidence that there are trophy bass in Picachos! That being said, I am still not ready to declare it a bonafide trophy bass lake. The reason being is that “most” anglers will not want to fish that deep, and some would not have experience in fishing water that deep. As I’ve mentioned many times in past updates, the majority of those big trophy bass live that deep because they do not like to compete for food with those smaller and faster swimming bass. Once the numbers of 2-4 lbs bass decline in the shallower water, then you will see more and more big bass make their way to the shallows. There are “some” now that live in the more popular and catchable depths (15′ or less), but the majority stay much deeper where there’s abundance of food and less competition for food, less pressure, and also adequate oxygen and favorable water temperature. All factor in to where a bass decides to set up home and particularly BIG bass! It won’t be long, folks — it won’t be long until I will feel comfortable labeling Picachos a great trophy bass lake!There are a lot in there now but until they’re in “catchable” or “preferred” depths, I will hold off. However, the lake is smoking hot right now for catching all the bass your heart desires and not a bunch of “dinks” either. This is THE BEST LAKE IN THE WORLD for great action and overall size combined! You could not pick a better lake to take a son/daughter or wife that’s just getting started on bass fishing. That also includes a friend that is a novice angler. You do not have to be a professional or seasoned bass angler to catch a lot of bass at Lake Picachos!!! Our lodge is absolutely 5-star quality with a breathtaking view of the lake. The lodge service is second-to-none and offers a staff that is very experienced, hospitable and puts you, the customer, as their #1 priority! Also second-to-none is our FOOD! We offer the best prime cut grilled ribeye steaks, seafood fest night with fresh shrimp from the Pacific and Mazatlan along with fresh lobster, a Mexican cuisine night and barbecue ribs one night. 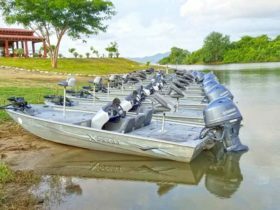 Ron Jr’s fleet of Xpress bass boats on Lake Picachos… The best boats in Mexico! Our bass boats are also second-to-none as we offer 17′ All Welded Xpress bass boats. Each boat is equipped with Yamaha 60 HP 4-stroke outboard motors, powerful Minn Kota 70 and 80 lbs thrust trolling motors and Lowrance 7″ fish sonars! In fact, we’re replacing ALL of the current sonars with new ones in March!!! Simply put, these are the best bass boats in all of Mexico!!! Our guides have more experience than any team of guides on Picachos and will put you on the fish! They are good with helping tie and re-tie your lures, making suggestions on what lures are best for that area or that day, landing your fish and opening your favorite beverage. The guide is the key to every angler’s success no matter where you fish in the world, and our guides are THE BEST!!! Guide Nico is one of Ron’s many great guides on Picachos. Here he is holding a 10lbs Monster caught by Ron Jr in 2014. There are more of these 10lbs in Picachos today. Finally, in case you missed my last two updates, we are offering a 2-for-1 special for any two family members such as father/son, father/daughter, mother/son, mother/daughter — or brother/brother. 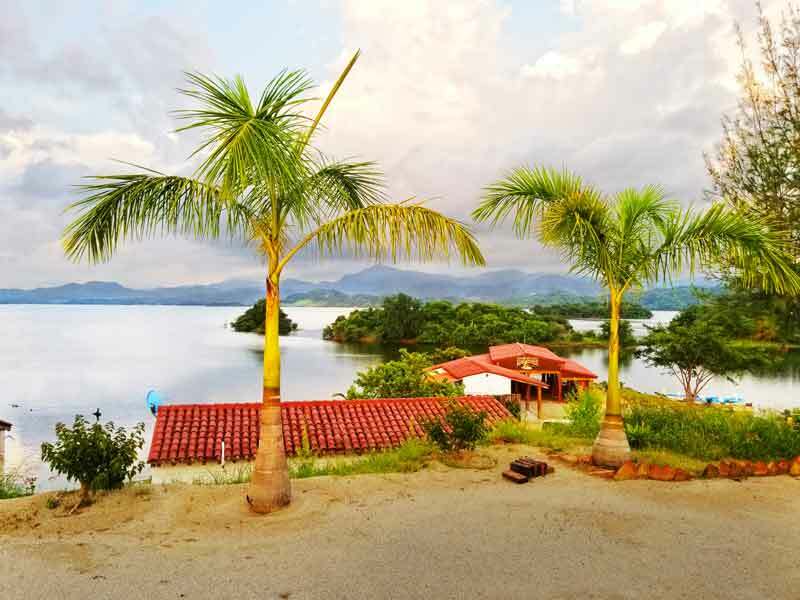 This 2-for-1 special is for the months of March, May, and June and applies to all 3 lakes (Comedero, El Salto, and Picachos). Do not miss this great opportunity to bring a loved one for a fishing experience of a lifetime! Those that have kids in school or college, they’ll be out for Spring Break in March and then out for the summer sometime in May. These months I’ve designated for the 2 for 1 discount were to specifically target those with kids in school. However, for those that do not have kids or want to take another relative, this is a great opportunity for you as well. DO NOT MISS OUT!!!! 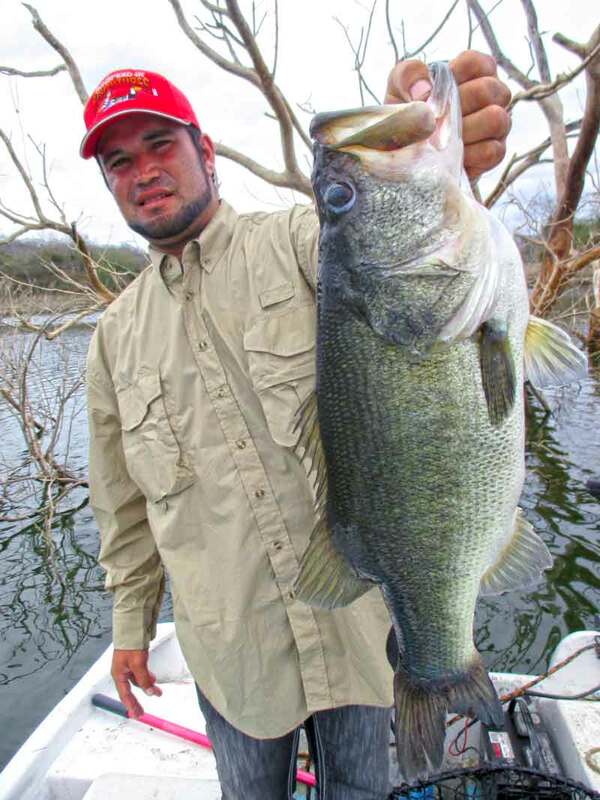 MAJOR LEAGUE FISHING CREW (TV SHOW) LANDS A LOT OF BIG BASS ON RECENT TRIP TO PICACHOS!!! Major League Fishing TV crew loves RSJA’s lodge and Lake Picachos!! There you have it folks! If you want a chance to catch big bass AND lots of bass in the same trip, same lake…this is your golden opportunity!!! 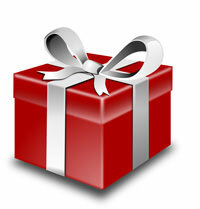 Last Chance to Give a Loved One the Gift of a Lifetime! Just a reminder Christmas will be here in about a week…and what better gift to give your loved one than a fishing trip of a lifetime to Mexico! In just 3 months the kids will be out of school for Spring Break! In approximately 5 1/2 months, they’ll be out of school for summer vacation. If you’re looking for that “special gift” to give for Christmas, I think I can help you decide. For those wanting to take a spouse, son, daughter , grandchild or any family member fishing with us to Picachos or El Salto in March (Spring Break) or May/June (start of summer vacation), we will offer you a 2 for 1 price. YES, that is 50% off the regular priced package. Two goes for the price of ONE! Since we are 100% full at Comedero in March, we will not be able to offer a special price there for March/Spring Break BUT…we will offer you the same 2 for 1 special for May/June at Comedero! Make a family member happy this Christmas with the gift of a lifetime.